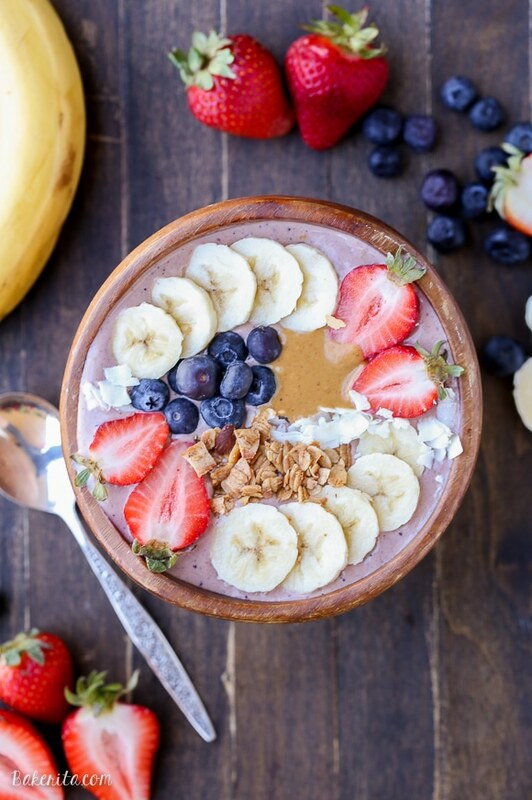 This Peanut Butter Acai Bowl is the perfect creamy, healthy, and peanut buttery breakfast! 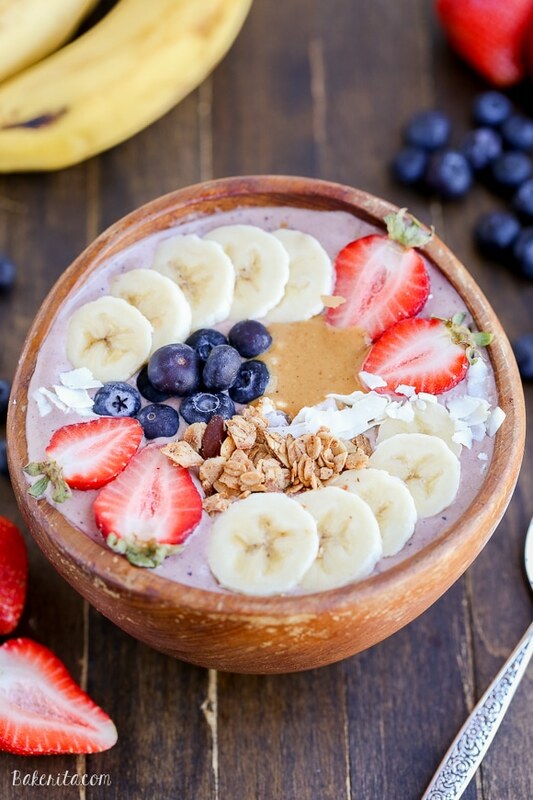 The recipe makes one thick smoothie bowl, best topped with fresh fruit, granola, and peanut butter. I’ve gotten pretty crazy obsessed with acai bowls and smoothie bowls since I discovered I could make them at home in my Vitamix. They’re the perfect breakfast or mid-day snack, especially in the summertime when you need something to help cool you off. At my place in Seattle, there was an acai bowl/jar bar place on my street called FIT BAR, and they had the best peanut butter acai bowl called Peanut Butter Power. 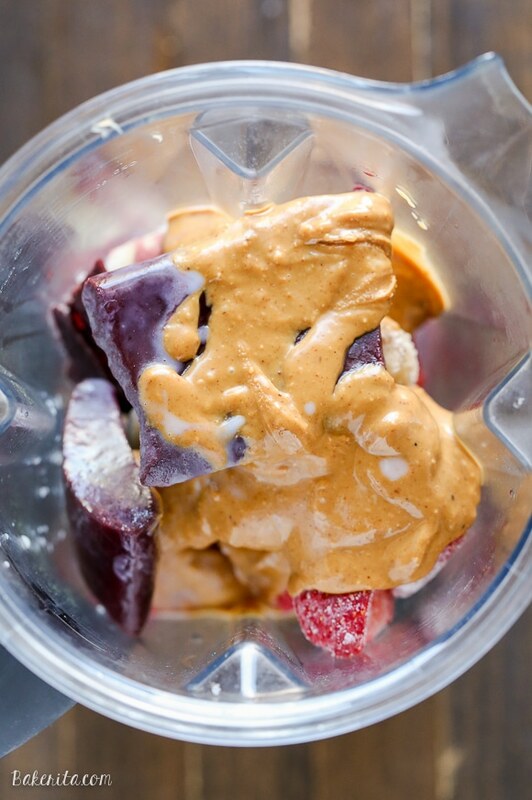 Not going to lie, guys – this recipe is my copycat of the peanut butter power acai bowl. But first! I need to tell YOU all about it so you can go make one too. It’s really super simple – you’re making a smoothie, but with less liquid, so it turns out thick enough to eat with a spoon. Add toppings, and you have the next best thing to ice cream for breakfast. I’ve had some people ask me on Snapchat where I get my acai from, so I should fill you in case you’re wondering too. I buy the frozen acai unsweetened superfruit pack from Sambazon, which I can usually find in the frozen section of the grocery store, near the frozen fruit. Grab the frozen berries too, while you’re there! The smoothie consists of frozen banana, which makes the bowl super creamy, frozen strawberries, frozen blueberries, an acai packet, a big spoonful of peanut butter, and a little milk! If peanut butter isn’t your thing, feel free to sub in almond butter, sunflower seed butter, cashew butter, or whatever your nut butter of choice is. Once it’s all smooth and creamy, pour your blend into a bowl and add your toppings. I added fresh blueberries, strawberries, sliced bananas, granola, coconut flakes, and of course, some more peanut butter. Go crazy with whatever you have on hand! In a high-powered blender, combine the bananas, berries, acai berry packet, peanut butter, and milk of choice. Blend until completely smooth. Pour into a bowl and top with berries, granola, and a drizzle of peanut butter. Enjoy immediately. 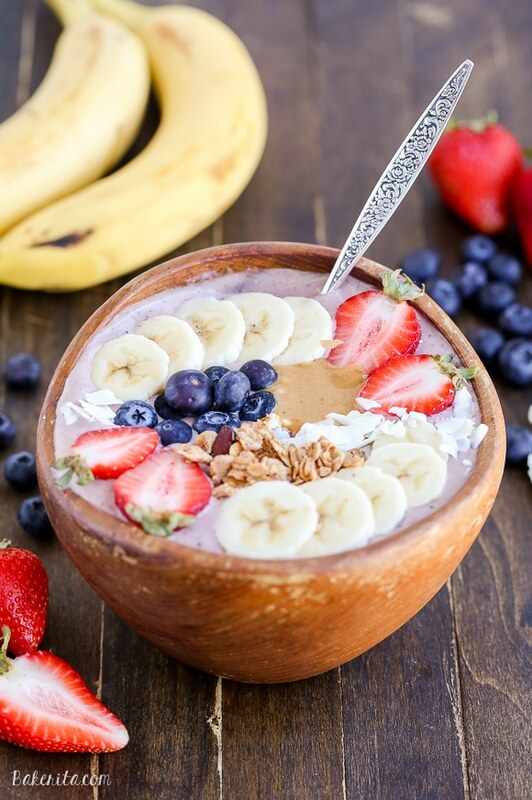 I’ve never tried an acai bowl before, but I do love smoothie bowls! This peanut butter version sounds SO good, Rachel! It sounds like you nailed this copy cat recipe. Love it! I’ve seen your acai bowls on snapchat and I’m always wishing I had one! I’m going to look for some acai because this needs to happen in my life soon! Why have I never put peanut butter in an acai bowl before??? This sounds just perfect! Acai bowls are literally HEAVEN in a bowl! Yay for peanut butter! It make the acai bowl that much better! YUM! 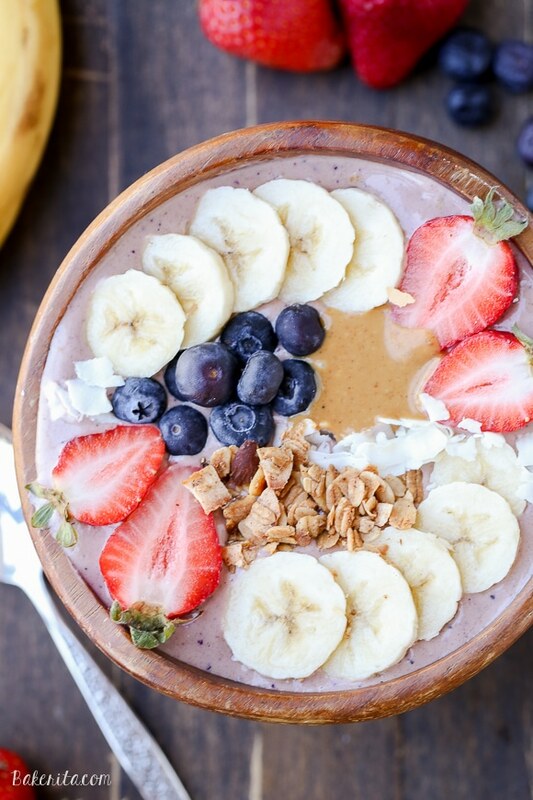 This acai bowl looks delicious- and YES to peanut butter. I can never get enough of the stuff! This is so pretty and I love the addition of the peanut butter! I’m having so much fun seeing the photos of your trip on IG too! So beautiful & filling looking. Must be incredibly satisfying with all that protein & fruit. Can’t wait to try it. I’m sure she’d love and appreciate it! Hope you enjoy your bowl this morning, Cassidy – this is one of my favorite breakfasts! Really great smoothie bowl recipe. Looks delish. Just pinned it. Just curious what is the acai packets brand you like to use ? Hi Anna – I like using Sambazon unsweetened acai. Trader Joe’s also has great unsweetened acai packets! Thanks for sharing this great breakfast recipe. Really it’s so simple. I just love bananas and berries.I will try this asap. I hope you love it Donna!! Thank you so much for the recipe! I can’t get it to blend with 1/4 cup milk -. I have to use about 3/4! Other than that I make it exactly as listed and it’s delicious!! Hi Lindsay – I like it SUPER thick so I use minimal almond milk :) the tamper helps a lot, but using more obviously also works. Glad you’re loving it! !